The kitchen usually forms the core of any house. Over time, kitchen décor has gone through a transformation with home owners looking for sleek designs and fancy lighting and appliances. Are you looking for an aesthetically designed kitchen? 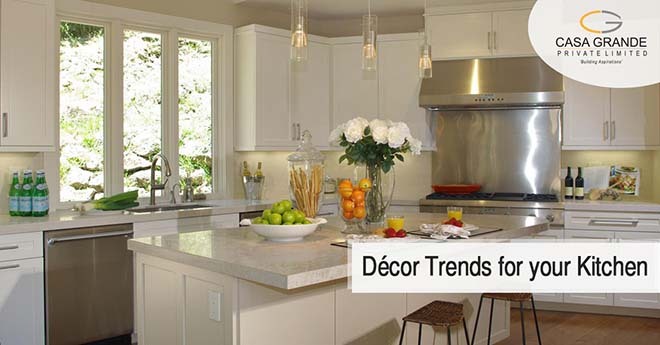 Read our blog on décor trends you can use for your kitchen. Bright colours for your kitchen will only make it look smaller than what it is. So go for the sophisticated look and paint your walls white or grey. Think this is a bit too dull? Don’t worry; you can always add some colour to other parts of the kitchen such as cabinet doors. Gone are the days when people preferred using granite and marble for kitchen counter top. Nowadays, new material named quartz is being used for kitchen countertops. Quartz is not only low maintenance but also be rendered in different colours, unlike granite and marble. Every season, a new colour is in vogue and this year it is black and white. Black and white kitchen is a classic and will never go out of style. The walls can remain white or grey, while the cupboards and fittings can be done in black. Replace your silver appliances with black stainless steel ones to give your kitchen a sophisticated touch. Most appliance companies are also now bringing out device in black to match this trend. Nowadays, modern appliances are getting prominence in the kitchen, and these appliances are convenient and highly automated. Another new trend that has come in the market is the built-in appliances concept. This concept not only looks incredibly cool but also saves space. They look sleek, adding that much-needed style to your kitchen. Thanks to the new trend of neutral and pastel colours being used for walls, we are always looking for ways to make our spaces more vibrant. If you are looking for a cool new way to make your house brighter, then geometric tiles are the answer. While geometric tiles were a popular choice only for bathrooms earlier, it is now making an entry into living rooms and kitchen as well. The bold colours and graphic pattern of these tiles will add a playful vibe to your living spaces. Lighting the kitchen well is something that is catching up in the décor world. A well-lit kitchen can make the area more efficient and enjoyable. LED lighting can enhance your kitchen, especially expensive crockery. For work areas such as the sink, you can use simple lighting as it needs to be clear and bright to allow the task be done well. You can also use decorative LED lighting in cabinets and LED strips to enhance the overall colours. LED is not only good décor idea but also is energy efficient and cost saving.